New book, 64 pages, ELI159. For over 20 years France was the dominating, controlling and conquering power of the western world, a result not only of Napoleon's inspired leadership, but of the efforts of almost an entire generation of Frenchmen under arms. The French Revolution heralded both social change and a seismic shift in how armies were organized, trained and deployed. This book provides an analysis of the preparation of French troops from manual regulations to the training ground, studying the changing quality of command and control within the army, which initially ensured that the French infantry were virtually unstoppable. 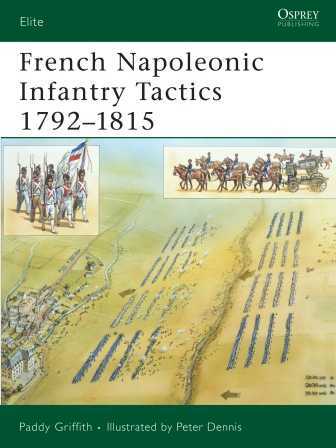 Paddy Griffith not only explores the role of the French infantry at the apex of their powers and their actions in key battles, but also provides a detailed explanation of their eventual decline leading to defeat at Waterloo, providing a critical overview of French Napoleonic infantry tactics. This item was added to our catalog on Wednesday 19 November, 2008.